Marthall’s Tony Walley just one of the colourful character’s at the Royal Cheshire County Show! In its inaugural royal year, the Royal Cheshire County Show is celebrating some of the Cheshire county’s colourful characters whose passion and enthusiasm are central to the Show’s spirit. One of our treasured participants is Marthall agricultural trader Tony Walley. 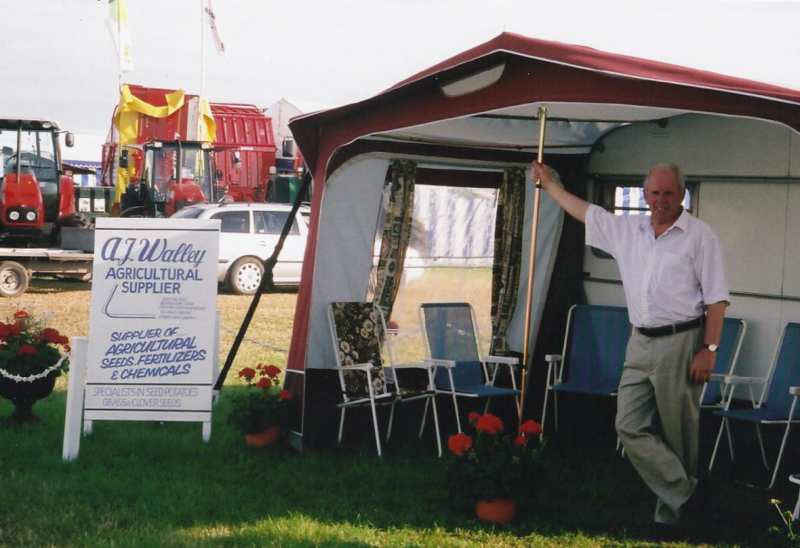 Tony is believed to be the longest running Show exhibitor, having personally attended every Cheshire Show since 1977 – nearly 40 years! Tony’s caravan-style stand, located next to Sainsbury’s Agri-Centre, is a familiar sight to those who visit the Show annually. Inside, the kettle is always hot and his ear open for a chat or to give advice on cereals, potatoes, fertilisers and their applications. “I go to the Show to give a cup of tea to my customers,” Tony said. “It’s my way of saying thank you so that when I go around to see my customers during the winter months, the kettle is put on to boil for me. Throughout the decades he has attended the Show, Tony says his caravan has been used for everything from a baby changing facility to a dressing room and counselling service. “I’ve had farmers slip in to change into their suit because they’re off to the Show dinner,” he said. He also remembers the attendance by all of the royal guests including Prince Charles (1998), Princess Anne (1999), Sophie, the Countess of Wessex (2012 as a visitor), Princess Anne (2013 as Show President) and Sophie, the Countess of Wessex (2014 as Show President). Cheshire Agricultural Society Chairman Tony Garnett DL ARAgS said Tony’ s passion for the event reverberated across the Showground. “I know a lot of people make it their business to stop by to see Tony whenever they attend the Show,” he said. You can visit Tony Walley at AJ and MA Walley Agricultural Merchant at Row D, Stand 23, next doorto the Sainsbury’s Agri-Centre. Contact the Royal Cheshire County Show office for Trade Stand bookings at this year’ s event on June 21 and 22 at Tabley Showground near Knutsford. Further Trade Stand information is also available here on our website.